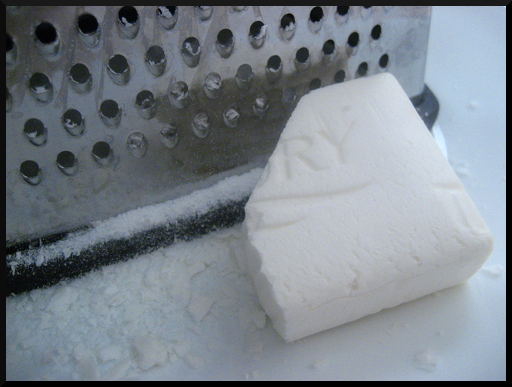 A few years back I tried doing homemade laundry soap of the powder variety. It wasn’t bad, but powder was more of a pain than I wanted to deal with since you needed to mix it with water to ensure that it dissolved properly. In 2008 I got my LG Tromm washer and dryer set, and it was HE so I used HE detergent until we came back to Nevada. I had been doing some research because I was pretty well set on not having commercial chemicals all over my house (yeah, I’ve cheated a bit, but I’m still over 75% on it). 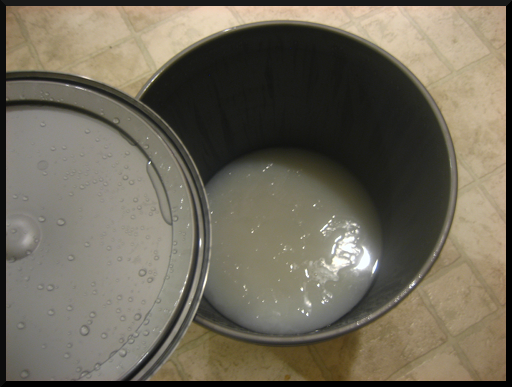 I found some HE friendly liquid laundry soap recipes that seemed easy enough. Place sauce pan with 6 cup of water on the stove and add grated Ivory bar, heat until Ivory bar is melted, but do not boil. Add Washing Soda and Borax. Stir until dissolved. 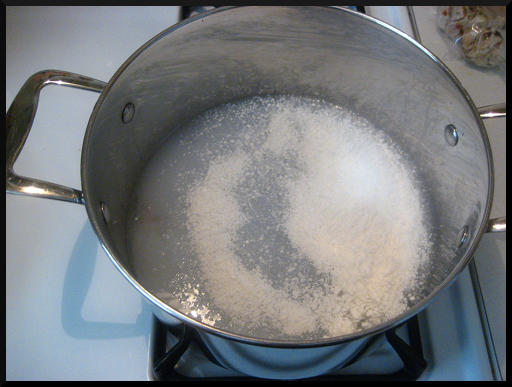 Remove from heat and pour into bucket, then add 20 cups of hot water. Stir. Add in essential oils if desired, stir. Tightly seal lid and let sit for 24 hours. When you open it it may be separated, simply give it a quick stir and it should look like this…. Use 1/2 cup per load of laundry. It’s safe for HE machines as it’s not high sudsing. I use a Rubbermaid bottle to hold a few cups of soap at a time so I’m not dripping soap from the bucket to my soap dispenser.